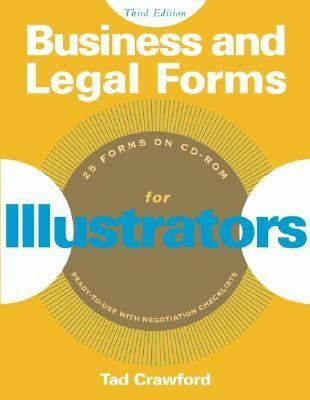 Containing 25 of the most essential business and legal forms to meet the everyday needs of today's successful illustrator, this updated edition includes new forms for trademark application, commercial lease, sublease, and lease assignment agreements. Unique negotiation checklists will guide illustrators to make the best deal. - "Belongs within easy reach of every working artist." --"Graphic Artists Guild News" - Includes a CD-ROM with electronic versions of the forms in Word and WordPerfect - Advertising in "Communication Arts" and "Graphic Artist Guild News" - This replaces 1-58115-008-3Crawford, Tad is the author of 'Business and Legal Forms for Illustrators', published 2004 under ISBN 9781581153644 and ISBN 1581153643. Loading marketplace prices 7 copies from $3.86 How does the rental process work?